Our travel writers have spent years traveling through Mexico to give you the low down on Mexico travel information. You will find that this site gives you the same basic information as the travel books at the store, with a difference . . . the information on AdvantageMexico.Com doesn't cost you a cent! So feel free to browse this Mexico travel guide at your leisure. Check out the pictures, download printable maps for your journey and desktop wallpaper for your computer. 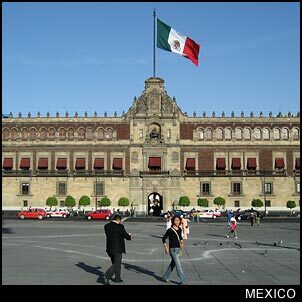 Mexico is a large country with regions which are very different from each other. The interior sections of Mexico are full of beautiful mountain cities with Spanish Colonial architecture. These cities will range from large modern cities like Monterrey and Mexico City to quaint pueblos like San Luis Potosi and San Miguel. Virtually all of the inland destinations from Mexico City and on south offer the addition of ruins from a once mighty civilization which rivaled the Roman empire 2000 years ago. If you are on a budget, stick to the small colonial cities where backpackers and the like are able to travel for around $600 to $800 USD per month. Live like the locals whenever possible. That means that if you want to rent a place . . . do as the locals and search the streets for rent signs. It may also help to hire a local (pay them around $20 USD) to help you find a place. Once established in affordable housing, spend your money in the mercado, visiting the local villages, attractions and beaches. If you are only in Mexico for a short time and want to see as much as possible . . . Plan your main destination as the place you want to spend most of your time, and hit the road for a few days. You will find that the buss system in Mexico far surpasses anything in the United States. It is cheap, clean, and even offers first class busses complete with air conditioning, comfortable airline style seats, and movies to help pass the time. Remember . . . Mexico is not Disney Land. It is like any other country in the world, and tips like staying in well lit areas after dark where there are plenty of other people are just common sense.